Minimum Cabinet Opeining Width: 19 1/4"
The kit is completely assembled, requiring only a screwdriver for installation. Included: instructions, 1 drawer box, 1 pair of cabinet tracks with attached metal brackets for easy mounting to horizontal surfaces, and 8 wood screws to mount the cabinet track to the cabinet base. Side: 1/2" Baltic Birch 9 Ply Pre-Finished. Bottom: 1/4" Baltic Birch Pre-Finished. 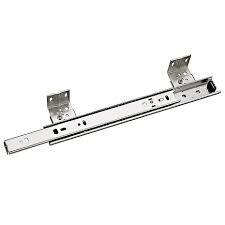 Minimum Cabinet Opening Width: 19-1/4"